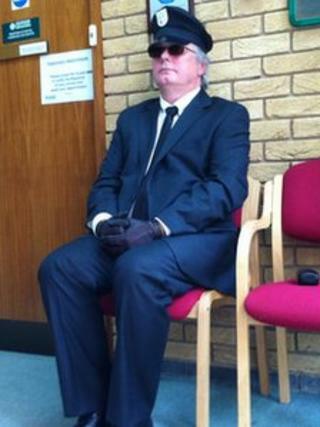 A councillor has attended a meeting with Thames Valley's police and crime commissioner (PCC) dressed as a chauffeur. Buckinghamshire town councillor Jon Harvey said he was making a 'humorous point' at the police and crime panel. PCC Anthony Stansfeld has defended the use of a part-time officer as his driver on a salary of £12,000, saying it helps improve his efficiency. The PCC's expenses are now to be independently reviewed. Mr Stansfeld branded Mr Harvey's actions "pathetic" at the meeting in Woodgreen, Witney, Oxfordshire. Mr Harvey said: "I have come to highlight the fact that our police and crime commissioner is spending quite a lot of money on a chauffeur during times of extreme austerity and so I thought I would make a somewhat humorous point by dressing as a chauffeur." The independent audit of Mr Stansfeld's expenses follows concerns raised about him using public money to pay for a satellite office in Hungerford near his home and a support officer. The officer is employed for an average three days a week as a driver and to undertake administrative duties. and also works for deputy police and crime commissioner David Carroll. Mr Stansfeld has said the officer, who also works for deputy police and crime commissioner David Carroll. has been put in place to help the pair to undertake their duties efficiently. The PCC claimed £15.30 and £7.20 in mileage for December and January respectively at a rate of 45p per mile. He claimed £452.25 for 1,005 miles in February and £600.30 for 1,334 miles in March after the Hungerford office was made available for his use in February. The PCC's office said mileage claims made between December and March related to Mr Stansfeld using his own car for official business. Since April he has had the use of a five-year-old ex-force fleet Audi A5 previously scheduled for disposal. A statement released on behalf of Mr Stansfeld said the Hungerford office was made available to increase his productivity and "reduce the amount of avoidable, non-productive time the PCC would otherwise spend travelling to his other office at Thames Valley Police Headquarters in Kidlington, near Oxford."